Blackthorn & Brook is delighted to announce that one of our luxury equestrian vacations is up for auction in the Countryside Alliance’s prestigious New York Sporting Auction. If you are in New York on 19 November, don’t miss this chance to bid on a special horseback trip with Blackthorn & Brook. The catalogue is stuffed to the gills with lots of other exctiting lots, from deer stalking at Blenheim Palace, to commissioned portraits by greats such as Leland Neff. 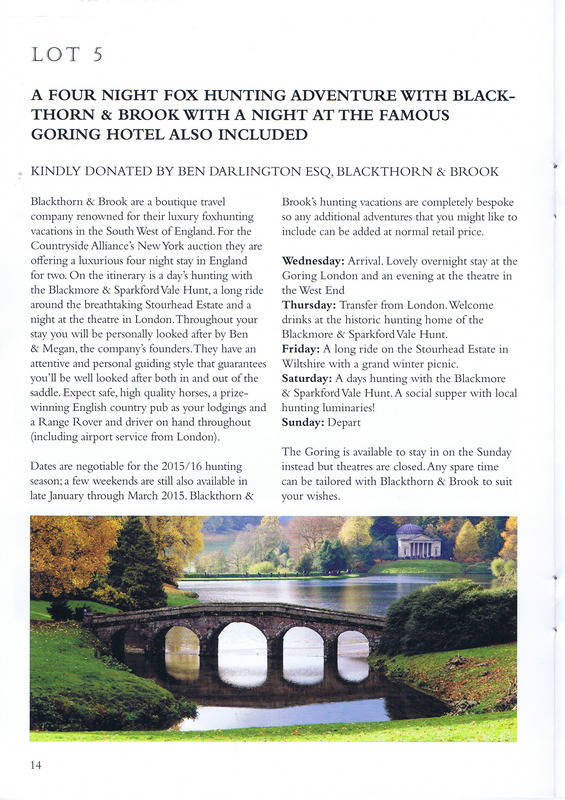 Blackthorn & Brook are a boutique travel company renowned for their luxury foxhunting vacations in the South West of England. 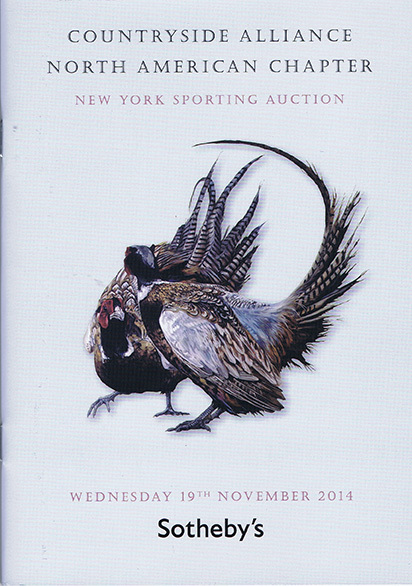 For the Countryside Alliance’s New York auction they are offering a luxurious four-night stay in England for two. On the itinerary are a day’s hunting with the Blackmore & Sparkford Vale Hunt, a long ride around the breathtaking Stourhead Estate and a night at the theatre in London. Throughout your stay you will be personally looked after by Ben & Megan, the company’s founders. They have an attentive and personal guiding style that guarantees you’ll be well looked after both in and out of the saddle. Expect safe, high quality horses, a prize-winning English Country pub as your lodgings and a Range Rover and driver on hand throughout (including airport service from London). Dates are negotiable for the 2015/16 hunting season; a few weekends are still also available in late January thru March 2015. Blackthorn & Brook’s hunting vacations are completely bespoke so any additional adventures that you might like to include can be added at normal retail price. Wednesday: Arrival. Lovely overnight stay at the Goring London and an evening at the theatre in the West End. Thursday: Transfer from London. Welcome drinks at the historic hunting home of the Blackmore & Sparkford Vale Hunt. Friday: A long ride on the Stourhead Estate in Wiltshire with a grand winter picnic. Saturday: A day’s hunting with the Blackmore & Sparkford Vale Hunt. A social supper with local hunting luminaries! Don’t miss this chance to bid on the luxury equestrian vacation of a lifetime! If you would like to attend the event please contact Lady Emma Mancroft of the Countryside Alliance at theladymancroft[at]countryside-alliance.org and quote Blackthorn & Brook. Happy bidding!